Whole grain corn, sugar, corn meal, brown sugar, corn cereal, salt, canola and/or rice bran oil, corn syrup, tricalcium phosphate, trisodium phosphate, natural and artificial flavor, Yellow 6, Blue 1, Red 40 and other color added. BHT added to preserve freshness. A General Mills customer service representative told me that the new cereal is being introduced nationwide and will soon be listed on the company's website. As with the company's Kix cereals, Sprinkles Cookie Crisp is not specially labeled gluten free. However, the label does not state that the cereal is produced in a facility where gluten-containing foods are manufactured or on shared equipment. I bought a box at the Acme market in Voorhees, New Jersey. 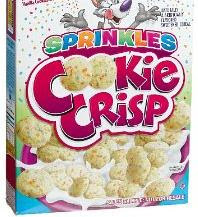 Sprinkles Cookie Crisp also is available online at Amazon.com. A local family-owned and operated pasta maker recently expanded its product line to cater to gluten-intolerant diners. Caesar's Pasta Specialties, a third-generation business based in Blackwood, New Jersey, has introduced all-natural, gluten-free frozen Italian entrees. 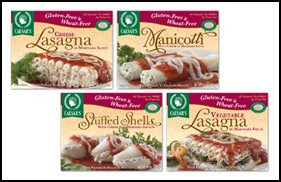 Caesar's gluten-free meals are made with rice pasta, ricotta cheese filling and marinara sauce. Varieties include stuffed shells, manicotti, cheese lasagna and vegetable lasagna. Michelle Hennessy, the company's Director of Sales, says that the idea for adding gluten-free entrees came from the fact that several members of the family that owns Caesar's are on gluten-restricted diets. According to Michelle, every batch of gluten-free product made by the company is lab-tested by third parties for the presence of gluten. She adds that based on the early success of this product line, the company is developing other gluten-free meals that she hopes will debut before the end of the year. Michelle also tells me that the company will be updating its website to provide more information about the meals. Caesar's gluten-free dishes are available at area supermarkets and health food stores. In addition, customers can stop by the company's headquarters at 1001 Lower Landing Road in Blackwood and purchase the gluten-free meals Monday through Friday during regular business hours. There have been online rumors over the past few months that General Mills had removed oats as an ingredient in its original Kix cereal but reported sightings of the product were rare as photos of the Loch Ness Monster. 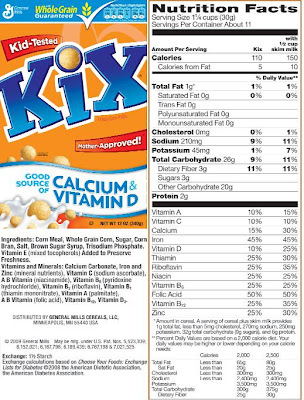 According to the updated product information on the General Mills website, Kix in fact no longer contains oats, which had the risk of being cross-contaminated with gluten in the harvesting process. With this change, now all of the Kix cereals - original Kix, Honey Kix and Berry Berry Kix - do not contain gluten ingredients. Note that unlike General Mills' recently reformulated Chex cereals, none of the Kix cereals are specifically labeled gluten free. This may mean that the Kix cereals are not made in a dedicated gluten-free manufacturing facility. Since this product change is recent, some markets may still be selling the older version until they run out. Be sure to check the package in the store prior to purchase. It was a busy week here at Gluten Free Philly. The site was flooded with hits this week after I wrote on Friday about the gluten-free ice cream sandwiches available exclusively at Whole Foods Markets through the end of July. The tasty treat, which is made by Julie's Organic Ice Cream and Glutenfreeda Foods, will be available at other stores and markets starting in August. I wrote on Wednesday about a new find called Naked Nuggets - healthy chicken nuggets that are grilled, not fried. They're available for purchase at health food stores in Pennsylvania and New Jersey and online. Yesterday, I posted about Dock Street Brewery's gluten-free beer that's available on draft for a limited time at the company's West Philadelphia restaurant. Also this week, I added a link to a map of the gluten-free friendly restaurants, bakeries and markets in northern Delaware. I'm working on maps of similar places in southeastern Pennsylvania and southern New Jersey and I'll let you know when they're up and running. I'll be updating the maps at the same time as the restaurant and market/bakery lists. Lots of people have inquired about the availability of Betty Crocker gluten-free dessert mixes at their local markets. While I haven't heard of any other stores in the Delaware Valley besides Wegmans currently carrying them, they are once again available for purchase (as of this writing) at Amazon.com. The mixes have been so popular that the online merchant had run out of its initial supply. Soffritto Italian Grill , located in my old college stomping grounds of Newark, Delaware, has posted its gluten-free menu on its website. Owner Giovanni Panza tells me that in addition to ordering from the restaurant's selections, diners can bring their own gluten-free pasta to be prepared by the kitchen using clean pots and separate utensils. Soffritto also serves desserts from Sweet Christine's Gluten Free Confections. Bella Vida Café's Wildwood Crest, New Jersey location now offers sandwiches and other menu items with gluten-free bread. A reader wrote that Maui's Dog House in North Wildwood, New Jersey has gluten-free hot dogs and hamburgers (no buns) and french fries cooked in a separate fryer. Seasons 52 at the Cherry Hill Mall has posted its Summer 2009 gluten-free menu. One other restaurant note: I mentioned in last week's News and Notes that Sam's Pizza Palace in North Wildwood, New Jersey recently added gluten-free pizza from Still Riding Pizza to its menu. In a comment to the post, a reader wrote that she could not recommend the restaurant for gluten-free diners based on what she says was the owner's description of the preparation method for gluten-free pizzas. If you plan on eating there (or any restaurant, for that matter), be sure to ask about the kitchen's precautions taken to reduce the chance of cross-contamination. While it's great that more and more restaurants offer gluten-free menus and accommodate the GF diet, it's good practice to ask questions of the chefs and waitstaffs, as this reader did. Back in May, I wrote about the Grind House Café in Haddonfield, New Jersey, which sells vegan gluten-free cookies made with vegan certified organic ingredients. It turns out these cookies are made by a bakery called Liz Lovely in Vermont. The company bakes six different kinds of gluten-free cookies, which can be ordered online or purchased at stores and markets in the Delaware Valley. Sprecher Brewery's Mbege and Shakparo beers, which I mentioned in my March post on gluten-free suds, currently are in the bottled beer rotation at The Grey Lodge Pub on Frankford Avenue in Northeast Philadelphia. In addition, the Grey Lodge offers Ciderjack, a European-style hard cider that is naturally gluten free. Pamela's Products has introduced a new line of ready-to-eat cakes and cheesecak es that will soon be in markets. The company's cheesecakes will available in 3” mini and 6” serving sizes and its chocolate cake and coffee cake in 6” and 9” sizes. Pamela's also announced the debut of a new cornbread and muffin mix and chocolate-dipped biscotti in vanilla and chocolate flavors. Aunt Gussie’s is expanding its product line by introducing new gluten-free English muffins and focaccia bread. Aunt Gussie’s new gluten-free breads will be arriving in stores starting in July. The new items are produced at a dedicated gluten-free baking facility built last year to make the company's line of gluten-free cookies. The English muffins are packaged 6 muffins per bag with a suggested retail price of $7.50 for an 18-ounce package. Available in Original and Cinnamon Raisin, the muffins are individually wrapped and frozen. The focaccia bread, available in Rosemary Onion and Kalamata Olive flavors, also is individually wrapped and frozen. Packaged 6 pieces per bag, the suggested retail price is $7.50 for a 16-ounce package. The new bread products can be found in health food and grocery stores and online through the company's website. French Meadow Bakery has launched new gluten-free tortillas. The tortillas are Certified Gluten-Free by The Gluten-Free Certification Organization (GFCO), a program of the Gluten Intolerance Group. The product is made with rice flour and tapioca starch, with zero grams of fat. French Meadow makes other gluten-free products such as rolls, pizza crusts, brownies and chocolate chip cookies. Whole Foods Markets has temporarily discontinued its Gluten Free Bakehouse sourdough bread and walnut brownies. I happened to like the sourdough bread - a nice alternative to sandwich-style bread. Finally, one bit of housekeeping - I plan on posting future News and Notes on Fridays instead of Thursdays, so look for it towards the end of the week. Whew! Hope there's enough info this week to satisfy your appetite. Keep the comments and tips coming to gfphilly[at]gmail[dot]com. Have a great weekend! Dock Street Brewery has just started serving a gluten-free beer at its West Philadelphia restaurant. Its African-style Sudan Grass Sorghum Ale is available for a limited time on draft. While I don't know if the beer has been tested for the presence of gluten, I'm told that the tap line and tank were cleaned before the start of the brewing process. Mat at the Philly Beer Scene blog writes favorably about the brew. One of our son's favorite meals after he was diagnosed with celiac disease was chicken nuggets. Although he liked eating them, my wife and I always felt guilty giving him something that wasn't all that healthy. I wish a product like Naked Nuggets had existed sooner. Eric and Bruce Bromberg, two chefs who operate several New York City restaurants, created Naked Nuggets, chicken nuggets that are grilled, not breaded or fried. The nuggets are made with seasoned, antibiotic-free white meat chicken and are, of course, gluten free. A serving of seven nuggets are only 140 calories and 3 grams of fat (1 gram of saturated fat). Blue Ribbon Restaurants, the company behind Naked Nuggets, recently began selling the product in 12 oz. bags (about four servings) in the Eastern United States. Several health food stores in the Delaware Valley carry Naked Nuggets; we bought a bag at Natural Health in Clementon, New Jersey. A complete list of locations can be found on the company's website. Naked Nuggets also are sold online through the Gluten Free Mall. Of course you can grill your own chicken and cut it up, but it is more convenient to make these - and certainly more fun to eat grilled chicken nuggets as finger food. The nuggets are fully cooked. While the package provides microwave directions, I don't recommend nuking the nuggets as they tend to get rubbery. Instead, I suggest preparing them in a skillet lined with fat-free cooking spray or oil or heating in the oven for a few minutes. 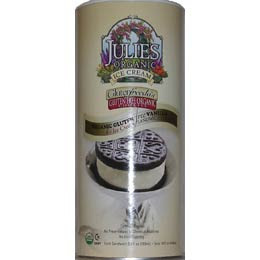 UPDATE (6/19/09): Julie's Organic Ice Cream Sandwich Cookies are available exclusively at Whole Foods until July 30, 2009 and will be available at other supermarkets and health food stores after that date. . . . I tried a sandwich this evening, and it was delicious. The cookies are thicker and firmer than the wafers used for non-GF sandwiches but they're still soft enough to enjoy the cookie and ice cream together in a single bite. A few years ago, I read about gluten-free ice cream sandwiches that supposedly were available for the Passover holiday. Although I searched near and far, I never found them and no one seemed to know anything about them. While they haven't turned up all of a sudden, there's a new product now out that fills the void. Julie’s Organic Ice Cream has partnered with Glutenfreeda Foods to introduce gluten-free, certified organic vanilla ice cream sandwiches. Glutenfreeda created the organic, gluten-free chocolate cookies, while Julie’s Organic developed the certified organic vanilla ice cream. The sandwiches contain no artificial colors or preservatives. The product, sold exclusively at Whole Foods, is available in packs of four sandwiches each. I paid $5.39 for a pack at the Whole Foods on Pennsylvania Avenue in Center City Philadelphia. I can't yet report on how they taste, but I'll update the post with that info soon. Leading off this week's news is the appearance of Betty Crocker's gluten-free dessert mixes at area markets. Some, if not all, of the varieties have been spotted at Wegmans stores in Pennsylvania and New Jersey. Wegmans is stocking the mixes in the baking goods aisle, not in the gluten free section of the stores. In addition, the mixes can now be ordered from Amazon.com. I wrote on Monday about our recent dinner at P.F. Chang's China Bistro, which offers a gluten-free menu featuring appetizers, entrees and a dessert. The location we ate at in Marlton, New Jersey even carries Redbridge gluten-free beer. Three restaurants were added this week to the Gluten Free Philly restaurant list. Yo Dogs in Wyndmoor, Pennsylvania serves beef hot dogs and hamburgers on gluten-free buns. The restaurant's salads also are gluten free. Owner Joanna Hoffman says that she hopes to have a dedicated fryer up and running in the couple months so that customers on gluten-free diets can also enjoy her hand-cut fries. Reader Janet mentions that the Chinatown Cafe on Route 213 in Langhorne, Pennsylvania. stocks rice noodles and gluten-free soy sauce. The Capital Grille at the Cherry Hill Mall in Cherry Hill, New Jersey is now open. Local 44, a bar at 44th & Spruce streets in West Philadelphia, serves New Grist gluten-free beer from Lakefront Brewery. Joe Palombo's Mirabella Cafe in Cherry Hill, New Jersey is now a participant in the GREAT restaurant awareness program sponsored by the National Foundation for Celiac Awareness. The restaurant is sponsoring another cooking class with Tammy Hughel. The gluten-free three-course tasting menu will be available at the class on Tuesday, July 14. The event starts at 6 p.m. and costs $40. Reservations for the class are recommended. We started with the gluten-free lettuce wraps appetizer, half a head of iceberg lettuce served with seasoned ground chicken and vegetable filling. Our older son ordered the savory Philip's Better Lemon Chicken as his dinner entree - cubes of chicken are coated with cornstarch and sauteed, served with broccoli in a sweet lemon sauce. His order included a side of rice. The restaurant serves numerous gluten-free chicken and seafood entrees and one noodle dish, Singapore Street Noodles. For dessert, we all shared a flourless chocolate dome cake, served with berries and drizzled with raspberry sauce. If only they had gluten-free fortune cookies! The entire menu is available for take-out as well. I also noticed that the Marlton location serves Redbridge beer, which is listed on the cocktail menu. The other area outposts may carry it as well, but you can call ahead to check whether they do or don't. P.F. Chang's recently started distributing a loyalty card called the "Warrior Card." The offers vary; in June, for example, presenting the card to the server entitles diners to 10 percent off the bill. Diners can sign up for the card on the restaurant's website or by completing a form at the restaurant. UPDATE (6/14/09): The Wegmans markets in Downingtown and Warrington, Pennsylvania and Mt. Laurel, New Jersey are carrying the mixes. I just returned from Wegmans in Cherry Hill, New Jersey, where all four Betty Crocker gluten-free dessert mixes are on the shelf. The brownie, chocolate chip cookie, yellow cake and devil's food cake mixes can be found in the baking goods aisle, not in the market's "gluten free" section. The mixes are made with a rice flour and potato starch base, along with other ingredients depending on the variety. The brownie and cookie mixes contain soy ingredients, while the cake mix labels state that those products "may contain soy." The mixes are priced at $3.99 each. The company's website offers "no butter" instructions that call for the use of vegetable oil or shortening to replace the butter suggested on the products' packaging. General Mills tells me that the products' roll-out started on June 1, and that most supermarkets should start carrying the mixes by July 1. If any readers have found them at other markets, leave a comment to let others know about it. I'll start off by mentioning that a commenter to a March post wrote that the gluten-free soft pretzels made by Dutch Country Soft Pretzels, one of the companies I listed, were comparable to those made with wheat. I finally got around to ordering a batch on Tuesday, and the shipment arrived overnight. The pretzels really are great! I ordered eight pretzels, which cost $11.99. The pretzels come from Lancaster County, Pennsylvania, wrapped and bagged, along with salt packets. Although the company's website recommends shipping via next-day air or second-day air, UPS Ground delivery (the least expensive option) runs around $9 for most, if not all, locations in the Delaware Valley and will probably arrive one or two business days after ordering. A company employee told me that gluten-free pretzels are made on days when the equipment is not being used for wheat pretzels, and that the machines are thoroughly cleaned prior to making the gluten-free variety. I've add ed a couple eateries in Mercer County, New Jersey to my list of gluten-free friendly restaurants. 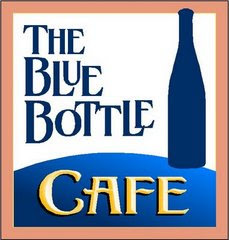 The Blue Bottle Cafe is a New American BYO in Hopewell, New Jersey that always has gluten-free options on its seasonal menu. There's a recent review of the place on uptake.com. Graziella Ristorante in Hamilton, New Jersey now serves gluten-free pasta. Also new to the list are three restaurants in Pennsylvania: Doylestown's Café Alessio, which serves gluten-free pizza and pasta; Horizons, offering New Vegan cuisine in Philadelphia; and Matyson, a Continental BYO also in Philadelphia. Reader Amanda let me know that Jules Thin Crust, which serves delicious gluten-free pizza, just opened its third location in Jenkintown, Pennsylvania. Online ordering is available for the Jenkintown location as well as for the spots in Doylestown and Newtown, Pennsylvania. Thanks to reader Sheli for details on the gluten-free fare at The Pop Shop in Collingswood, New Jersey. The Pop Shop's gluten-free bread is purchased from a gluten-free bakery and can be used for sandwiches or toasted as a side order. Most of the egg dishes and salads are gluten free. The grilled gluten-free items are prepared on a separate cooktop using specially-labeled utensils to avoid cross-contamination. In addition, the chocolate, chocolate marshmallow, vanilla, peanut butter swirl, soy vanilla and soy chocolate ice creams are safe for celiacs. Stefano's Ristorante Italiano in Mt. Laurel, New Jersey is now a participant in the GREAT restaurant awareness program sponsored by the National Foundation for Celiac Awareness. The restaurant's off-site catering business, Balsamo Catering, also is part of the program. Spice of Life, a gluten-free bakery out of Lancaster County, Pennsylvania, now takes pre-orders on its website (at a 15 percent discount) for pickup at three local farmers' markets. The company's breads, rolls, cookies and pastries are available every Saturday at the markets in Bryn Mawr, Pennsylvania and in Philadelphia at Rittenhouse Square (at Walnut Street, west of 18th Street) and Headhouse Square (2nd and Lombard streets). Thanks to reader Monica for the heads-up. A new shop serving gluten-free frozen yogurt - or as people younger than me say, "froyo" - has opened in Center City Philadelphia. Sweet Ending, at 18th and Chestnut streets, serves up to 11 different flavors of nonfat tart-style yogurt from self-serve machines. The fruit-flavored yogurts can be topped off with many gluten-free toppings, from fresh fruit to chocolate chips. The yogurt costs 49 cents an ounce. Store hours are from 10 a.m. to 10 p.m. Monday through Thursday, 10 a.m. to 2 a.m. Friday and Saturday, and 10 a.m. to 10 p.m. on Sunday. Simply Organic has introduced two new gluten-free dessert mixes: Cocoa Cayenne Cupcakes and Honeypot Ginger Cookies. These products are additions to the company's line of gluten-free baking mixes, which are available at area Wegmans markets. The company's other varieties are Banana Bread, Chai Spice Scone, Carrot Cake and Cocoa Biscotti. As always, please feel free to write me at gfphilly[at]gmail[dot]com with tips on upcoming events, new products, or restaurants and bakeries serving gluten-free foods. Have a great weekend! New this week was the National Foundation for Celiac Awareness's announcement that its June Monday Meet-Up event will be held on June 15 at Joe Palombo's Mirabella Cafe in Cherry Hill, New Jersey. Mirabella Cafe was one of five South Jersey restaurants that participated in a celiac awareness event this past Tuesday. We ate at The Tortilla Press in Collingswood, where my older son enjoyed chicken fajitas (with corn tortillas) and Boston cream pie made by Di Bartolo's Bakery. I added a link to Ruby Tuesday's gluten-free menu to my restaurant compilation, which now lists nearly 100 gluten-free friendly dining establishments. Ruby Tuesday, a chain of bar-and-grill restaurants, has many locations throughout the Delaware Valley. Gluten-free pizza is now available at Alfredo's, located at 2900 West Chester Pike in Broomall, Pennsylvania. I've also added A Cupcake Wonderland to the list of gluten-free bakeries. A Cupcake Wonderland, based in Philadelphia, is run by two preschool teachers who create customized cupcakes that can be made gluten free. Bunn's Natural Foods in Southampton, Pennsylvania is hosting its second annual gluten-free food fair, rain or shine, on Saturday, June 6 from 11 a.m. to 3 p.m. The fair will include offerings from more than 20 manufacturers, free samples, demonstrations, raffles and prizes. On Sunday, June 7, the Children's Hospital of Philadelphia children's support group will co-host an "indoor picnic" with the Southern New Jersey adult support group. The event will take place on the campus of Virtua-West Jersey Hospital in Voorhees, New Jersey, at the Barry D. Brown Health Education Center, from 2 p.m. to 4 p.m. All participants should bring their favorite gluten-free picnic item. Reservations should be made by Thursday, June 4 by emailing celiaccenter[at]email[dot]chop[dot]edu or by calling (267) 426-6822. In last week's News and Notes, I mentioned that Lois Quigley, a holistic health counselor, will be speaking on Wednesday, June 10 at the Whole Foods Market in Jenkintown, Pennsylvania on "Gluten Free Living." On Tuesday, June 9, Ms. Quigley will lead "Gluten Free Alternatives for Kids and Lunch" at the South Street Philadelphia Whole Foods. The program, which is designed for children, takes place from 11 a.m. to noon and includes a gluten-free lunch. Although there is no cost to attend, all participants must register in advance at the store's customer service desk as class size is limited. Back in March, I wrote about Conte's Pasta, a company in Vineland, New Jersey that makes gluten-free pizza, ravioli, stuffed shells, gnocchi and pierogies. Amazon.com is running a special offer this month - through June 30, 2009, you can save 20 percent when you spend $59 or more on Conte's gluten free products. Use promotional code CONTE224 at checkout. Amazon.com also is offering free one-business-day shipping, which is recommended due to the products' perishable nature. Just select the expedited shipping option at checkout. Don't forget to drop me a line at gfphilly[at]gmail[dot]com with tips on any events, new products you've seen at the market, or restaurants that have added gluten-free menus. Have a great weekend!